Of course, it is to a great extent, a lifestyle statement that broadcasts the fact that the individual and his family have ‘arrived’ and should be numbered among the country’s wealthiest and most influential people. This statement alone brings inalienable social benefits with it. Fundamentally, these ‘palaces’ serve the same purpose that the homes of other affluent people do. At the same time, they also encompass a number of practical functions – they serve not only as residences but also as business centers and entertainment complexes. In other words, these residences have strategic importance to their owners and are not mere indulgences. They also generate considerable employment and commerce in and around the localities they occupy. 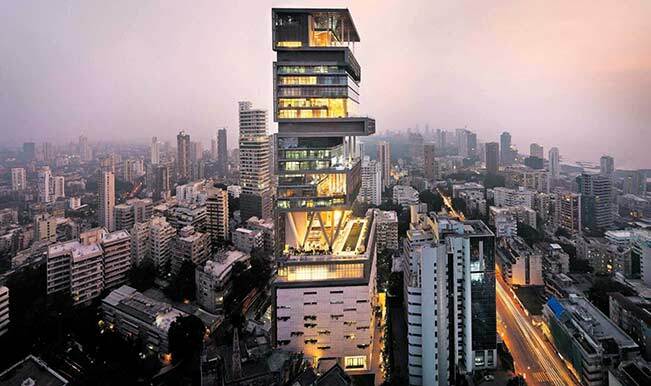 For instance, Ambani’s Antilia in South Mumbai provides jobs to no less than 600 people from all levels of the services industry. Many of the supplies that go into building such houses and keeping them operational must necessarily come from the local markets. Coupled with the employment-generation factor, they should be seen as economic dynamos in their own right. Beyond doubt, the homes of the super-rich create a certain upward pressure on the price tags of luxury and premium homes in the immediate vicinity. However, it is also true that the real estate market, in general, is not affected; these luxury developments represent a minuscule segment of the wider fabric. The Indian residential property sector operates on three distinct levels. The first is affordable or budget housing, for which the demand is constant and highest. Such housing does not occur anywhere near the prime areas where HNIs tend to build their homes, and remains entirely unaffected by these developments. The next is mid-income housing, which is most sensitive to price movements. Though certain mid-income housing projects do happen near the prime areas of our cities, buyers in this segment have very little tolerance for unnatural spiking of property prices. Builders of such projects have to keep the larger market in mind and can ill afford to price themselves out of the market. This segment is therefore also not significantly affected, either. This leaves premium and luxury housing, which does happen in the neighbourhoods in which India’s mega-rich build their homes. This rarefied segment caters to a class of buyers that tends to be, at least to a large extent, insulated from the usual financial concerns of home loan interest rates and percentile increases in property rates. In the super-luxury housing segment, home buying (and building) is also a lifestyle-related undertaking. Increased property rates can and are often borne as long as there is a commensurate increase in the capital value and aspirational quotient of the property. Ironically, for this segment, a higher ticket size is sometimes valued more as it attaches an ‘esteem value’ to the property and limits its accessibility to the masses. Many tend to look at these super-luxury residential properties as irrational extravagances. However, the ground reality is that the homes of India’s super-rich play their own role in boosting commerce, even as the larger industry remains democratized and oriented to the needs of the masses.